Udaipur is one of the most visited places in Rajasthan and is immensely popular amongst tourists for its royal palaces and beautiful lakes. Therefore, it is known as the city of lakes. If there is any place where you can find the essence of royalty dispersed in the air, then it is certainly Udaipur. Such is the popularity of this royal city that it is frequented by tourists from all over the world. After all, who doesn't want to experience the beauty of royalty? It is rightly said that if you are looking forward to travelling back in time and have a desire for royal and luxurious experiences, then you must head towards Udaipur. As per historical records, Udaipur is said to have been in existence for thousands of years. However, the city was founded in the late 16th century by Udai Singh, the king of Mewar. Today, Udaipur has become a quintessential destination for every traveller who desires to get lost in a royal aura. Due to its location in the vicinity of Jaipur, it makes for a perfect weekend getaway from Jaipur. So, what do you think of a trip from Jaipur to Udaipur now? Even though the region in and around Udaipur experiences a hot weather during the summer season, it is a year-round destination on account of the presence of several beautiful lakes and lush green hills. These natural beauties help in maintaining a bearable climate throughout the year. However, if you do not desire to experience the hot sun of Udaipur, then the best time to visit is from October until the end of March. By Air: Udaipur has its own airport which is well connected to all other major cities in India. Hence, you can catch a direct flight from Jaipur to Udaipur. By Rail: You can catch a direct train to Udaipur from Jaipur. It will take you an approximate time of 8 h to reach your destination from Jaipur. By Road: Udaipur has a good road connectivity and hence, you can easily approach it by road. You can either hire a direct cab or catch a direct bus to Udaipur from Jaipur. As route 1 will take only 6 h, i.e., half an hour lesser in comparison to the other route, to reach Udaipur, it is a preferred route. On your way, you can take a break at the following places and explore their natural as well as historical beauties. Ajmer is located at a distance of about 134 km from Jaipur and 262 km from Udaipur and is a popular pilgrimage centre as it serves as the base for the tourists coming to visit Brahma Temple in Pushkar, which is located at a distance of about 10 km from the main city. However, it is also noted for its historical monuments and architectural wonders. Even though the history of Ajmer is unknown, it is believed to have been established in the Vedic Period. The major places to visit in Ajmer include Brahma Temple, Ajmer Dargah Sharif, Taragarh Fort, Nareli Jain Temple and Akbari Fort & Museum. Another historical beauty lying on your way, Rajsamand is popular for its marble production. Hence, it is also sometimes referred to as Asia's Largest Marble Market. However, it is famous amongst tourists for its historical sites and Rajsamand Lake, an artificial lake which was built in the 17th century by Rana Singh of the Mewar Kingdom. Since then, this lake has been an evening and morning destination for the locals, who come here to get a breath of fresh air. It is located at a distance of about 336 km from Jaipur and 62 km from Udaipur. Eventually, after covering a distance of about 395 km from Jaipur, you will be exposed to the beautiful world of lakes and palaces, Udaipur. Even though Udaipur has become every traveller's destination over a period of time on account of its beautiful lakes and royal palaces, there are still several places, such as gardens, which deserve to be explored. Following are the places which you must visit on this trip to experience the actual beauty of Udaipur. If you are an ardent traveller, you cannot afford to miss these alluring places. Can you really visit Udaipur and not visit its most valuable gems? Yes, these royal palaces in Udaipur are highly responsible for increasing tourism in Rajasthan. If you are looking forward to gaining a royal experience and to feel the essence of royalty, then these places are must-visit destinations for you. 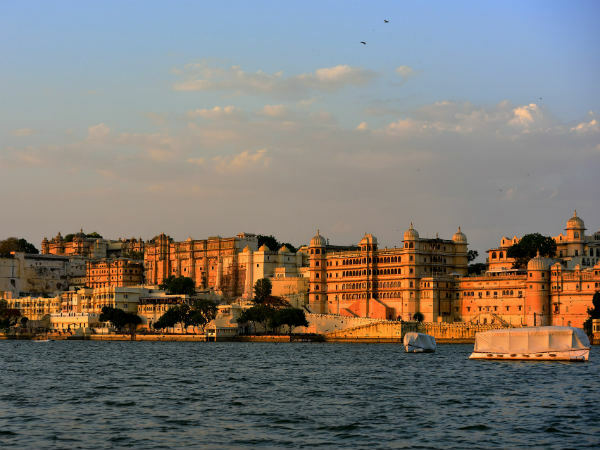 The list includes City Palace, Lake Palace, Jag Mandir and Monsoon Palace. How is possible to explore the natural beauty of Udaipur unless you have frequented its dazzling beauties in the form of lakes? The lakes in Udaipur are some of the major reasons why it is equally popular amongst history enthusiasts and nature lovers. Wouldn't you love to explore the historical sites of Udaipur as you move past the soothing waters of lakes in a cruise boat? The actual beauty of Udaipur cannot be framed without the lakes. The list includes Fateh Sagar Lake, Lake Pichola, Swaroop Sagar Lake and Doodh Talai Lake. If you desire to find yourself in the midst of a spiritual aura filled with divinity and peace, then these temples in Udaipur are perfect places you should visit. The list includes Kesariyaji Temple, Jagdish Temple, Neemach Mata Temple and Karni Mata Temple. The list of tourists attractions in Udaipur doesn't end with its lakes, palaces and temples only. There is more to explore within its royal boundaries. Do you really think a royal world would be complete without gardens and parks? If not, then you must not forget visiting its colourful gardens which will certainly leave an everlasting impact on you on account of their fresh environment and vibrant surroundings. The list includes Gulab Bagh, Pratap Park and Saheliyon-ki-Bari. Other tourist places here are Moti Magri and Pratap Gaurav Kendra.